In the deserts of Western Libya, on cliffs and boulders along the edge of a dry riverbed called Wadi Mattendush, are rock carvings cut by a culture making the jump from hunter-gathering to nomadic pastoral farming around 4,000 years ago. Possibly re-cut many times, their carvings show animals in a Libya before the Sahara arrived – giraffes and elephants are accurately depicted. One carving shows two dog-headed men dragging away the body of a rhino, or possibly using magic to control it. Wadi Mattendush is just one rock-carving site featuring dog-headed men scattered around Libya’s Messak (“plateau”) region. David Coulson of the Trust for African Rock Art says these dog-headed figures are “quite common” at five different sites around Messak and just over the Algerian border at Tassili n Ajjer. One shows a dog-headed human carrying a club, with a dog-headed baby at his feet. Another Messak dog-head is carrying away an aurochs on its shoulders. Since this earliest appearance, dog-headed men have been with us ever since, appearing as illustrations on world maps well into the sixteenth century, and in many of the medieval world’s most widely read books. While some came to imagine dog-headed cohorts among the armies of the Antichrist, there were also dog-headed Christian saints. The dog-headed races - or cynocephali to use their scientific name – were the subject of debate by Christian theologians from St Augustine onwards. (2) Dog-headed men get a mention in some of the oldest Arthurian poetry and in the (mythical) deeds of Alexander the Great. Conquistadors expected to encounter them, and the world ‘cannibal’ may have come from the man-eating cynocephalic peoples. Dog-headed men are now regarded as the stuff of folklore, the product of misidentification. But this hasn’t prevented clusters of sightings from modern times of dog-headed entities that shouldn’t exist but are nonetheless reported. And within the rich modern mythos of ufology there’s a sub-genre of impossible close encounters with extra-terrestrial ‘dog-like’ humanoids. The ancient Egyptians bequeathed a mini-pantheon of cynocephalic deities; the best-known being the canine-headed god is Anubis (aka Anpu). There was also the jackal-headed Duamutef, protector of the stomach, whose head is found on canoptic jars protecting organs removed on mummification. 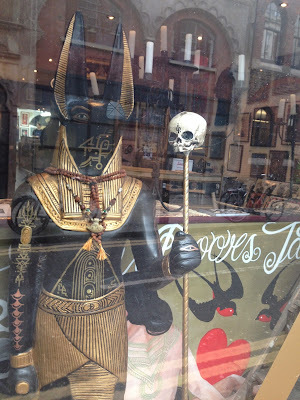 Anubis was often depicted as a warrior, as was the more ancient jackal/wolf-headed Upuaut (‘he who opens the way’), who featured in battle standards in the earliest armies of ancient Egypt and who shared many honorific titles with Anubis. Anubis was imported into the Roman Empire, and merged with aspects of Roman gods. In Persian miniatures and some medieval illustrations, dog-headed men are depicted – like Anubis - as black-skinned and wearing loincloths. Furthermore, the early Eastern Orthodox dog-headed version of St Christopher seems to have come out of Christian Egypt. It was Herodotus who first associated the dog-headed men with headless men (acephali) and Cyclopses. Henceforth they were frequently lumped together, sometimes assumed to be one and the same. Claudius Aelianus, a philosopher writing sometime between 175 and 235 AD, described the dog-headed men of India in his On the Nature of Animals as “honest and harmless creatures” who “are righteous and harm no one.” They eat the raw, sun-dried “flesh of wild beast”, but also raise sheep and goats. C. Plinius Secundus (Pliny) in his Natural Histories, appearing around 79 AD, has a description of dog-headed men almost identical to Ctesias. Pliny says (book 7, ch. 20) they are ‘with heads like dogs’ and ‘sharp and trenchant nails… They live on prey which they get by chasing wild beasts and fowling.’ Unlike Ctesias, Pliny places dog-headed men in Ethiopia. The land of the Ethiopians, (literally any “people with burnt skin”) and India were to the Greeks all part of the same vast and impossibly exotic region. As if the real deeds of the historical Alexander the Great weren’t spectacular enough, one version of Romance has him capture numerous dog-headed cannibals following a pitched battle with a 40,000-strong dog-headed army, which “barked wildly” and fled when Alexander set the surrounding scrubland on fire. The Romance ends with Alexander “walling up” the remaining dog-headed men along with the other unclean races beyond the mountain peaks of the Caucuses at the edge of the earth. Here they were said to lie in wait, poised to sweep across Christendom in the armies of the Antichrist. In later versions, dog-headed men came to resemble Turks, Mongols or whoever posed the latest threat from the East. Franciscan Monk Juan de Pian de Cipriano even reported seeing dog-headed men on a visit to the court of the Mongol “Great Khan” in 1246. In thirteenth century Wales, all manner of legends were attaching themselves to the name of a King Arthur, whose heroic followers were being named for the first time. The contemporary Welsh language poem Pa Gur (“What man..?”), from the Black Book of Carmathen, may be based on much earlier sources, and introduces the Arthurian knight Sir Kei. 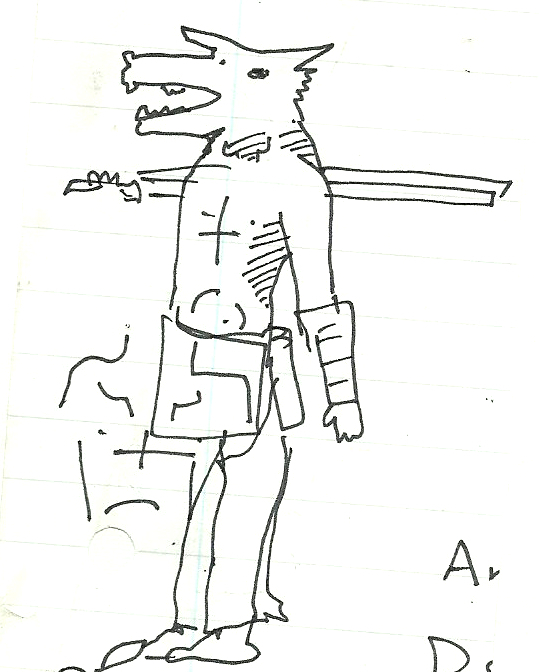 Kei’s epic deeds are listed, he “slaughtered adversaries three at a time, killed a witch in the hall at Awarnach… He killed Cinbin (“dog-heads”) at Minit Eiden” (Edinburgh). “Dog-heads” could have been a derogatory term for a local ethnic group or band of outlaws. St Isadore of Seville’s Etymologies (some time around 636 AD) attempted to merge Classical learning in a Christian allegorical tradition. The Etymologies section “On human monstrosities” says “The Cynocephali are so-called because they have dogs’ heads and their very barking betrays them as beasts rather than men.” Works like Etymologies led to the bestiaries and allegorical maps of the world, always with Jerusalem or the Garden of Eden at the centre. Naturally, the usual repertoire of dog-headed men, cannibals, headless men, huge-eared humans and so forth found their way onto allegorical world maps. In Medieval maps like the fragmentary Duchy of Cornwall Map and Hereford Mappamundi (where dog-headed men are labelled ‘Gigantes’) they were normally slotted in along with the Cyclopses and acephali in panels in East Africa – the furthest landmass in Medieval cosmology from the Garden of Eden and therefore the furthest from God. Among the hierarchy of the blessed and the damned, dog-headed men were somewhere between beasts and men, creatures created along with humans on the sixth day of creation, but not quite human. Some dog-headed men – as in the tiny 1265 Westminster Psalter World Map, are shown chewing on severed human limbs. The Nuremberg Chronicle of 1492 includes a World Map which has dog-headed men in a side panel, and the Ottoman Turkish 1513 vintage Piri Reis Map of World puts dog-headed men in the recently discovered South America, along with men with no heads. Long after it became obvious the New World had no such creatures, Pierre Descelier’s world map of 1550 depicted dog-headed men in an elaborate human sacrifice scene in a vague Southern supercontinent of “Australle”. Dog-headed men turn up in Christian devotional art throughout Medieval Europe, found among choruses praising the Lord, among the “nations of the world” receiving the Gospel in representations of the Pentecost, bringing Christianity to the corners of the world, or ascended to Heaven. The monks at the Greek Orthodox monastery complex at Mount Athos are said to be reluctant to show to visitors the St Christopher dog’s tooth relic, and one fresco of a fully human St Christopher at Mount Athos appears to have been painted over an earlier dog-headed version. It seems the current Western Christian version of St Christopher, as a child-carrying human giant, arose in the twelfth century and over the next two hundred years pushed out the prevailing dog-headed version of the saint. 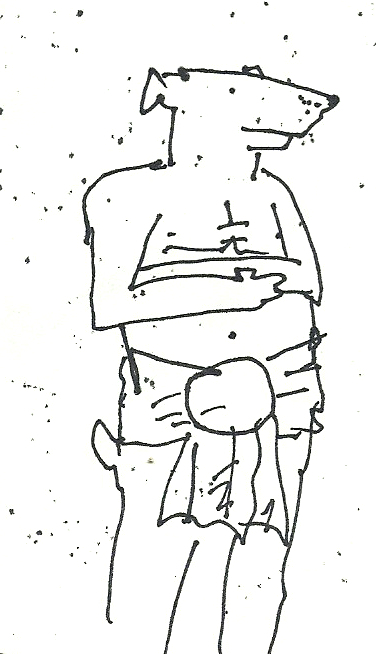 Walter Loeschke’s 1965 study of a “Tieköpgigen Christophoros” found 70 examples of dog-headed St Christophers in Christian iconography from Russia to Ireland. The Earliest known dog-headed St Christopher reference was the fourth century Coptic Egyptian Acts of St Andrew and St Bartholomew among the Parthians, in which the saints convert a dog-headed cannibal ogre Christoianus, who joins them in missionary work in Parthia. In the Ethiopian version, St Christopher is the only dog-head among a City of Cannibals to which Bartholomew and Andrew are magically transported. Often Christopher is given that name (and the power of speech) on his conversion, and had the name “Reprobus” (Abominable) before he converts. Christopher first appears in his own right in eighth century Spain. In another version of the legend, Reprobus is a handsome youth who is “granted” an ugly dog’s head after praying for a way to avoid the temptations of the flesh. Nor was St Christopher the only dog-headed saint. The Syrian Coptic St Mercurius – like St Christopher, martyred by the Roman Emperor Decius - has two faithful dog-headed retainers who were converts to Christianity. Mercurius and Christopher were often depicted as a warrior saint standing to attention, not unlike the soldierly Anubis. In parts of Austria, on St Thomas’ Night, St Thomas is said to appear in the form of a barking dog-headed man. Dog-headed men began to feature in “serious” secular travelogues. Published around 1300 as Description of the World (aka Book of the World’s Marvels), the travelogue of Marco Polo said of an unnamed island in “The Indies” that “all the men of this island have heads like dogs, and teeth and eyes like dogs; for I assure you that the whole aspect of their faces is that of big mastiffs. They are a very cruel race: whenever they can get hold of a man who is not one of their kind, they devour him." 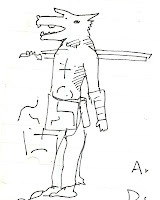 Odorico de Pordenone reported in 1327 that dog-headed men dwelt in the “Nicuneman Islands” (1327) although neither author claimed to have actually seen them. English author John Mandeville’s pre-printing “bestseller” The Travels (between 1357 and 1371) had accurate, first-hand information on sites in the Holy Land, but also included descriptions of “folk of diverse shape and marvellously disfigured”, among them the dog-headed men of ‘the island of Nacumeran’ (the Nicobar Islands of the Indian Ocean?) and says they “worshipped the ox” and were led by a king who wore a huge ruby on a chain round his neck. French inquisitor Cardinal Pierre d’Ailley’s Ymago Mundi (written 1410) compiled ancient writings on what we’d now call natural history. D’Ailly located some cynocephali in India, where “they bark like dogs” and mentioned another dog-headed race that have “but one eye and are called Carismaspi.” Christopher Columbus carefully noted in the margins of his copy of Ymago d’Ailly’s assertion that it was difficult to determine whether “men with monstrous features and horrible appearance” inhabiting the “extreme regions” are humans or beasts. So Columbus expected to encounter dog-headed men and other “monstrous races” in the New World. Landing on Bohio (Haiti) he wrote that, “Everyone I have met so far has said he is very frightened of the Caniba or Canina who live in the island of Bohio”, and noted the terror in his Indian guides at the mention of Canina. Columbus’ diary for 23 November 1492 recorded eyewitness accounts that the cannibals “have one eye on the forehead and the head of a dog,” and he added, “I also understand that, a long distance from here, there are men with one eye and others with dogs’ snouts who eat men.” He and his expedition had almost no knowledge of the local language, with guides probably telling him what they thought he wanted to hear, and it gradually dawned on Columbus that the Caniba and Canina were one and the same, and might not actually be cyclopean or dog-headed. However, Columbus’ perfectly rational explanation was equally bizarre: “the Caniba are none other than the people of the Great Khan (the Emperor of China), who must be very near here. They have ships that come to these lands to capture these people and take them away. Since the people never return, it is believed that they have been eaten.” It’s possibly from Columbus’ legendary Caniba (“canine”) tribe that the word “cannibal” is derived. Sponsors of conquistador expeditions continued to take dog-headed men seriously. Possibly the last example of this was instructions from Diego Velázquez de Cuéllar, Spanish governor of Hispaniola (Cuba) to conquistador Hernan Cortes on the eve of his 1519 expedition to Mexico, including instructions to find the “whereabouts” of Amazons and to confirm reports “of people with huge ears and even some with the faces of dogs.” Columbus in a 1493 letter to Queen Isabella admitted, “In these islands I have so far found no human monstrosities, as many expected,” and it was soon clear that the New World has no cynocephali. So what accounted for such widespread belief in dog-headed men for so long? Misidentified baboons seem the most likely explanation. In modern French, un cynocéphale just means a baboon. Papio cynocephalus is the scientific name of East Africa’s yellow baboon, while another species is officially designated the Anubis baboon, living in the Sahara. Both Ethiopia and Western Libya, identified as the home of dog-headed men by Pliny and Herodotus respectively, are still the habitat of at least one baboon species. The thirteenth century Bodleian Bestiary puts “dog-headed men” in the same section as apes and monkeys, along with the “sphinx” – Mandrillus sphinx is a species of the baboon’s close relative, the mandrill. Ctesias said dog-headed men lived in India, and Herodotus reported many Indian dog-handling troops in the Persian army, while both Pliny and Ctesias refer to Indian ‘dog-milkers,’ probably a variation on the Svapaka (“suckled by dogs”) “untouchable” caste. Other “untouchable” groups in India include the Nishada ‘dog-cookers’ caste or ethnic group, relegated by caste law to the edges of towns. People given “doggie” attributes are often the lowest of the low in society, and it could be that Greek authors transmitted garbled accounts of low-caste groups in ancient India that were referred to in this way, or that traditionally performed “unclean” tasks such as breeding or handling dogs. In Northern India in particular, marrying outside your caste was seen as something that could give rise to “monstrous races”, with some “untouchable” groups said to have originated from forbidden mixed-caste unions. Such racial anxieties are by no means unique to India – horror stories of “changelings” and “unnatural” unions with strange women on the fringes of the civilised that would result in “monstrous births” were common the world over. But where were the dog-headed women? On the outside of a Medieval abbey church in Vézelay, France there’s a rare depiction of a dog-headed woman and her male dog-headed partner on the road to redemption. John Mandeville’s Travels says that in the Nicobar islands “Men and women of that isle have heads like dogs, and they are called Cynocephales.” Over time, the dog-headed men became closely associated with the Amazons. The Romance of Alexander gradually turned the Amazons into the sexual partners of the dog-headed men, stating that female Amazon/dog-headed men offspring are indistinguishable from “normal” women and are assimilated into Amazonian society, while their male offspring are born with dog-heads and are inducted into the dog-headed hordes. One later version of the Romance of Alexander has dog-headed men living by the ‘eastern Ocean’ beyond the Taurus mountains with a race of women. 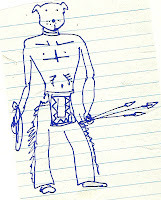 There was a “bulge” in nocturnal “indigenous dog-man” encounters – usually reported anonymously to Godfrey by email – throughout the early 1990s, although Godfrey found reports going back as far as 1936, when a Mark Schankelman saw a 6ft black and hairy foul-smelling pointy eared creature “somewhere between a dog and an ape”, digging at an ancient burial mound. Among the numerous sightings that Godfrey lists – including two different encounters with a group of four “manwolves” – was the sighting of a “manwolf” by several guards at Chicago’s Great Lakes Naval Base in 1994. 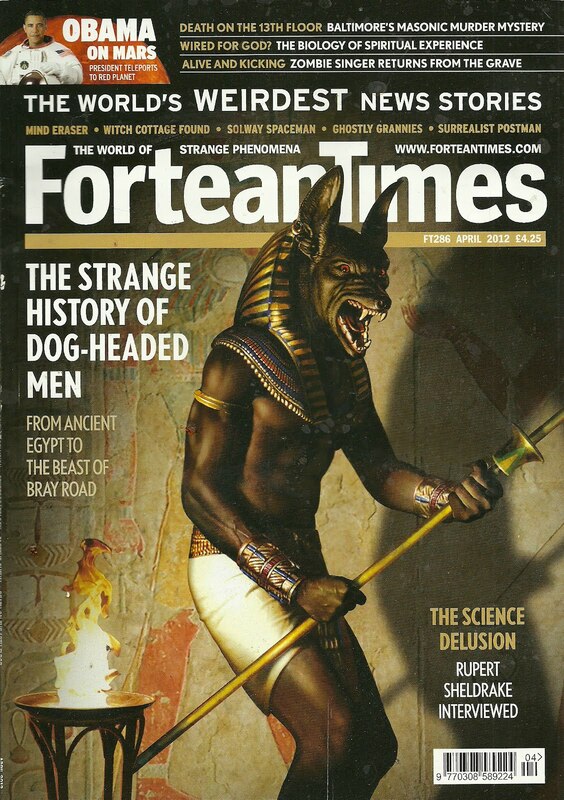 And Fortean Times’s Malaysian correspondent Ajad Jamalidom back in 1979 sent reports of several sightings of a vanishing dog-headed man at Pekan, on the country’s mainland east coast (FT 254;80). Exploration of much of the earth’s surface and advances in our understanding of evolutionary biology would seem to have exiled dog-headed men to outer space! 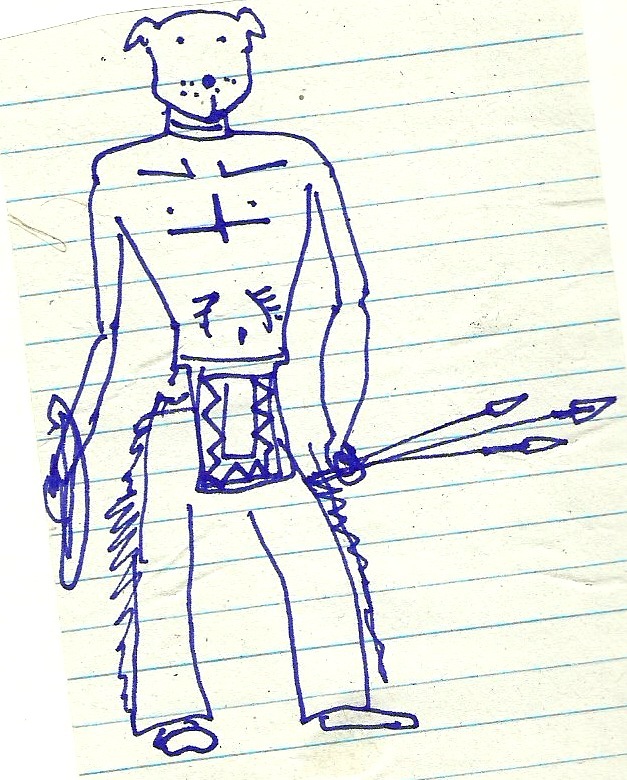 See also cryptozoologist Dale Drinnon's recent blog post on "dog-men" in North America, and possible explanations. 1 Tertia Barnett, archaeologist, pers. comm; David Coulson, Chief Executive of the Trust for African Rock Art, Niarobi, Kenya, pers. comm (both October 2011);Footprint Libya handbook: the travel guide, James Azema, Passport Books, Lincolnwood, Illinois, 2001; Wadi Mattendush photographs and line drawings are here. 2 St Augustine of Hippo in his City of God (Book XVI, Chapter 9, early 5th century AD) placed dog-headed men in Ethiopia, and after much agonising as to whether they were human or existed at all, concluded that they were human and ‘were indeed descendants of Adam’ and also of Cain and the disobedient sons of Noah (Genesis, 9.19). Augustine reasoned that even monstrous births had to be part of some unfathomable plan, and opened heaven’s gate to the monstrous races. 3 The staring straight ahead Anubis in art and sculpture doesn’t always represent the god Anubis himself, but often a priest wearing a ceremonial mask of Anubis. 5 On the Track of Unknown Animals, Bernard Heuvelmans, Kegan Paul, London 1995 edition; Fabulous Animals, David Attenborough, BBC, London 1975; ‘Shug Monkeys and Werewolves – The Search for the Dog-Headed Men,’ Jon Downes & Richard Freeman, Fortean Studies vol. 5, John Brown Publishing, London 1998: video of Faith the upright-walking dog linked from here. I have also excluded reports of “shug-monkeys” from Rendelsham Forest, Suffolk, and elsewhere in Britain, as these creatures, described as a cross between a dog and an ape or a lion and an ape, are usually on four legs don’t seem to be all that human-like. Etymologies, St Isidore of Seville, book IV, “On men and monsters”, online here. African Rock Art: paintings and engravings on stone, David Coulson, Alec Campbell, Abrams, New York 2000. Just published is the first ever biography of Dr Kit Pedler, best known as creator of the Cybermen for Doctor Who, but also the co-author of 1970s environmental sci-fi drama shocker Doomwatch, presenter of scientifically rigorous early 1980s paranormal investigation series Mind Over Matter and a medical doctor with a double doctorate who headed London's Institute of Ophthalmology and did some pioneering work on early electron microscope investigation of lizard's eyes. The Quest for Pedler - The life and times of Dr Kit Pedler by Michael Seely, published by Miwk books includes among its sources my 2006 Fortean Times article on Dr Pedler - 'Father of the Cybermen'.